We receive so many queries day in and day out as to whether distilled water is actually healthy. As is the case with most however, customers prefer to hear from others who’ve experienced things for themselves, which is why we thought we’d share Sally-Ann’s story. Sally-Ann Creed is a nutritional therapist from South Africa and has suffered with chronic asthma, panic attacks and severe sinus problems for many years. Thanks to distilled water however, she’s managed to turn her life around for the better. 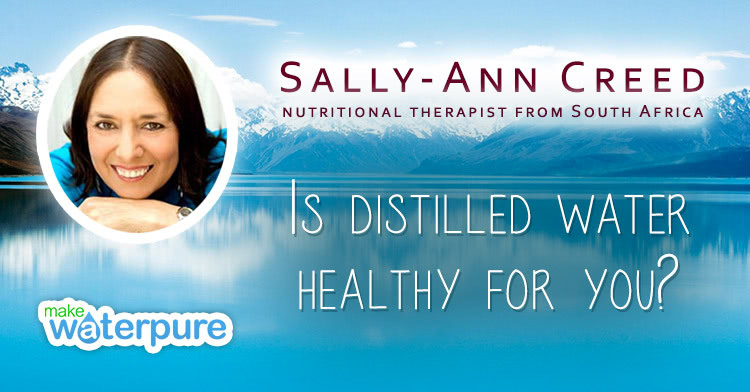 Here’s Sally-Ann’s experience that will hopefully help you to understand fully the health benefits of distilled water. Having had their own water distiller for six years now, Sally and her husband consider it to be the best health decision they’ve ever made. Having gone to quite a large expense in terms of plumbing in a carbon filtration system some years earlier, they thought that a water distiller would do little for them. Using the distiller for the first time however, they found themselves surprised by how much dirt and sediment was still in the bottom of their distilling machine. Carbon filters alone it seemed, did little to stop contaminants reaching their drinking water. They even noticed that the nasty green sediment their kettle gathered after just a few months of use was a thing of the past since using distilled water in their new one. Sally and her husband still had a few questions when it came to the water’s pH level so set out to find out more. Sally, as a nutritionist, was quick to remind us however that the stomach has an acidic environment and whatever reaches the stomach is dealt with by stomach acid. This is how our bodies were designed as only an acidic environment can digest everything we consume. After looking at bottled water however she found that the majority of pH levels were between 5.2 and 6.4 whereas distilled water had a much higher level at around 6.8. A recent study also caught Sally’s interest as it found that the vast majority of bottled water contained some sort of undesirable lurking within it and was in fact a lot worse than tap water. Sally soon realised that not only was our tap water, air and soil polluted but so too was the supposedly clean bottled water that she’d trusted for many years. This is what led Sally and her husband toward distilled water and its many advantages. With all respected authorities and experts agreeing that they’d seen wonderful changes in people that begun using distilled water, it was time to give the purest of water a try. Firstly lets answer the question “what’s pure water?” by answering another “what isn’t pure water?” A good question to ask yourself is whether you’d drink the dirty water from your dishwater, your radiator or even your dog’s bowl? We can guarantee that every single one of you would answer no to this and the reason for it is simply because it dirty and no doubt contains all manner of undesirable content. We put the very best fuel in our cars in order to get the very best performance out of it so it stands to reason that we should only put the very best water in our bodies. Dirty water or mineral water is hard water and as you probably know it’s not easy to wash dishes in hard water, nor is it pleasant boiling hard water in a kettle as it leaves dirty residue. It therefore makes sense to explain that dirty water is very inefficient at cleaning the human body. Pure water on the other hand is the complete opposite. Through the process of distillation, all unwanted inorganic and organic matter is stripped from the water apart from tiny particles of essential anionic calcium, potassium and chlorine. Distilled water is therefore not totally empty as it contains a few highly acceptable minerals in organic form. This water is also classed as a rather high energy water. This means that the water molecules have very little to tie them up. This all results in softer, wetter water that has a lower surface tension. This makes it very efficient at moving energy in and throughout cell membranes. Whereas hard water places a huge burden upon the kidneys, distilled water simply flushes them out. As a nutritionist Sally was also aware that in nature, water is also distilled during the metabolic functions of the plant and therefore highlighted the point that when we drank fruit juice, we were in fact drinking naturally distilled water. Although fruit juice couldn’t obviously take the place of distilled water, she found this to be a good example of just how natural distilled water actually is. The last myth Sally decided to put to rest surrounded the subject of minerals. As a nutritionist she was already aware of the fact that the body could only assimilate minerals that had been through the root of a plant. Plants adore inorganic minerals as this is how they receive them but we aren’t plants and simply don’t have the ability to process them. Our human bodies need them in organic form and we can only obtain these via plants and whole foods. Sally went on to explain that although many believe distilled water was unhealthy due to its lack of minerals, this just wasn’t the case at all. Having used distilled water for six years, Sally and her husband are not only healthier but a lot happier too. After spending a huge amount of money on bottled water and a home carbon filtration system, they now notice not just the health benefits but the financial benefits too as they create a litre of distilled water for a mere 9p. If you’d like to find out more about the health benefits from people that have used distilled water then simply click here and read our customer reviews.